As of 2017[update] Bowling Green offered over 200 undergraduate programs, as well as master's and doctoral degrees through eight academic colleges. Its academic programs have been nationally ranked by Forbes magazine, U.S. News & World Report, and Washington Monthly. The University is also ranked the most affordable college in Ohio by Business Insider in 2018. Additionally, in 2018 BGSU received designation as an Innovation and Economic Prosperity (IEP) university by the Association of Public and Land-Grant Universities (APLU) and its Commission on Innovation, Competitiveness, and Economic Prosperity. The 2011 Carnegie Foundation classified BGSU as having "high research activity". Research projects in the areas of psychology, sociology, education and human development, energy and sustainability are among the most prominent. BGSU had an on-campus residential student population of approximately 6,000 students and a total enrollment of over 19,000 students as of 2018[update]. The university also maintains a satellite campus, known as BGSU Firelands, in Huron, Ohio, 60 miles (97 km) east of the main campus. Although the majority of students attend classes on BGSU's main campus, about 2,000 students attend classes at Firelands and about 600 additional students attend online. About 85% of Bowling Green's students are from Ohio. The university hosts an extensive student life program, with over 300 student organizations. Fielding athletic teams known as Bowling Green Falcons, the university competes at the NCAA Division I level (FBS for football) as a member of the Mid-American Conference in all sports except ice hockey, in which the university is a member of the Western Collegiate Hockey Association. The campus is home to annual events including the Dance Marathon (a student-organized philanthropy event) and State Fire School. The movement for a public high learning institution in northwestern Ohio began in the late 1800s as part of the growth in public institutions during the Progressive Era to meet demands for training and professional development of teachers. During the period, people of northwestern Ohio campaigned for a school in their region to produce better quality education and educators. The movement argued that the existing universities, Ohio State University in Columbus, Miami University in Oxford and Ohio University in Athens, were distant and the region lacked a state-supported school of its own. In 1910, the Ohio General Assembly passed the Lowry Normal School Bill that authorized Governor Judson Harmon to appoint the Commission on Normal School Sites to survey forty communities for two sites for normal schools, one in northeastern Ohio and one in northwestern Ohio. The commission examined population within a 25-mile (40.2 km) radius of each community, along with railroad and transportation infrastructure, the moral atmosphere, health and sanitary conditions and site suitability. Bowling Green offered four possible sites and became one of four finalists including Fremont, Napoleon, and Van Wert. Despite the town being the home of John Lowry, Napoleon was ruled out because the commission found it had numerous saloons. Fremont was eliminated mainly due to the specific stipulations imposed by the President Rutherford B. Hayes Memorial Commission. Bowling Green was chosen on November 10, 1910, over Van Wert in a 3–2 vote by the commission. The site located on 82.5 acres (0.334 km2) of primarily rural land and a small town park, nearby railroad and transportation infrastructure, its central location in the region, and Bowling Green's dry status were major factors that the town was chosen by the commission. At the same time, the commission chose Kent for a school in Northeastern Ohio. Over the years 1911 and 1912, the Board of Trustees was appointed by the Governor and elected a school president on February 16, 1912. A campus plan was created and $150,000 was appropriated to develop the campus and construct the first buildings. The school opened on September 15, 1914, as Bowling Green State Normal School in two temporary locations at the Bowling Green Armory and at a branch school in Toledo for the 1914–1915 academic year. It initially enrolled 304 students from Ohio, Michigan, and New York who were taught by 21 faculty members. The school graduated its first class in 1915, consisting of 35 certified teachers. University Hall and Williams Hall opened that year, the school's first two permanent buildings. Two years later the first baccalaureate degrees for teacher education were awarded. On March 28, 1920, a tornado, part of the 1920 Palm Sunday tornado outbreak, damaged three of the school's buildings. The tornado touched down near Bowling Green and strengthened as it moved into Ottawa County where it killed two people in Genoa. Over the next decade the school expanded academic facilities, athletics and student life, as enrollment grew to over 900 students. On October 28, 1927, Ivan "Doc" Lake, a BGSU graduate and sports editor of the Daily Sentinel-Tribune, established the nickname “Falcons". Lake thought the falcon was a fitting nickname because the falcon is a small but powerful bird of prey, and like the athletes, goes through extensive preparations and training. He also thought the nickname fit with the school's colors. Prior to Lake's creation of the nickname, sports writers used various others, including: “B.G. Normals,” “Teachers,” and the “B.G. Pedagogues". The school achieved the status of college in 1929 when the Emmons-Hanna Bill renamed it to Bowling Green State College (BGSC). At the same time, the college expanded its curriculum through the addition of the College of Liberal Arts, now known as the College of Arts and Sciences. Enrollment levels held steady into the Great Depression; but in 1933, the Ohio State Senate Welfare Commission proposed a plan to convert the school into a mental health institution. Students, faculty and administrators organized with the Bowling Green community to counter the proposal. The Student Protest Committee coordinated with the faculty and administration to organize a campus rally and march through the downtown Bowling Green. Members of the Protest Committee then launched a letter-writing campaign to community leaders throughout northwest Ohio, which helped convince the state legislature that closing the school would be counterproductive. The measure was defeated by a 14–5 vote. A few years later, in May 1935, the college was granted university status and changed its name to Bowling Green State University. The university added the College of Business Administration to the existing College of Education and College of Liberal Arts. Within a year BGSU added master's degree programs in Education, English, History, Social Science and Mathematics. In 1939, the university established The Committee for Gifts, Endowments, and Memorials, its first private endowment fund. The 1940s, including World War II and its aftermath, brought big changes to BGSU. The war caused a drastic decrease in male enrollment and by 1943, the university canceled dances and formals, citing the lack of male students. The university continued expanding facilities including its first student union, The Falcon's Nest, and new cottage-style dorms for social groups and learning-living communities, and dedication of the Wood County airport. Bowling Green was one of 240 colleges and universities to take part in the V-5 and V-12 Navy College Training Programs to supplement the lower enrollment during the war. The programs offered students a path to a Navy commission, enrolling cadets in regular college courses as well as naval training. Faculty were added to accommodate the military training programs. Student life adapted to the wartime era with efforts such as the War Relief Committee, blood drives and War Bonds initiatives. 1951 saw major changes when Ralph W. McDonald was appointed the fourth president in school history, following the retirement of Frank Prout. McDonald was the first university president from outside Ohio and came to BGSU with a focus on improving teacher education and certification standards. Prior to becoming president, he served as the Executive Secretary of the Department of Higher Education of the National Education Association for seven years. Under McDonald, BGSU reorganized its three colleges to group common departments together within each college. Reflecting the Cold War era, BGSU added an Air Force ROTC program and a Department of Air Science and Tactics. BGSU continued to add programs and in the early 1950s added a Master of Education (M.Ed.) and a Master of Science (M.S.) in Education. The university constructed new residence halls during the decade, Prout Hall in 1955 and Founders Quadrangle in 1957. The new student center opened in 1958, after four years of construction at a cost of $2.75 million. In the years 2012–2014, the residence hall was renovated and remodeled. This renovation updated the rooms, bathrooms, lobbies and outside sidewalks and walkways. In 2008, the university began the first phase of a $200 million renovation project. BGSU first announced plans for the Stroh Center, a 5,000-seat arena to replace the aging Anderson Arena. The $36 million arena opened in September 2011, hosting basketball and volleyball; in addition to graduation ceremonies, concerts and other events. The arena was named for Kermit Stroh and Mary Lu Stroh, who donated $7.7 million for the project, the largest single private gift in BGSU's history. In 2009 the university began construction on the Wolfe Center for the Arts. The 93,000-square-foot (8,600 m2) facility opened in 2011 with performance space, as well as work and classroom areas for art studies of the School of Art, the Department of Theatre and Film, and the School of Musical Arts. The facility was designed by Norwegian architectural firm Snøhetta, the firm's first American project. That same year, BGSU built a $40 million residence hall project that included two new residence halls, one a traditional-style dorm and a second suite-style for upperclassmen. The residence hall project added more than 800 beds. In the fall of 2011, BGSU opened The Oaks dining hall. The Oaks was constructed with sustainable designs that included a hybrid solar and wind power system to fulfill Leadership in Energy and Environmental Design (LEED), an electric-powered truck to distribute food on campus, and a rooftop garden. The building used sustainable and recycled construction materials. In 2016 and 2017, three major renovations were complete to three original campus building, totaling about $70 million. The former South Hall was re-opened in fall 2016 after undergoing a $24 million renovation and renaming to The Michael and Sarah Kuhlin Center. The building is home to BGSU’s School of Media and Communications. Following a $25 million renovation and restoration, University Hall re-opened in Fall 2017. It was originally built in 1915 and was one of the first building on campus and represents a tie to the University past while recognizing technology and new ways of learning in today’s educational environment. Today, University Hall houses the Office of Admissions, cutting-edge classrooms emphasizing technology, and active learning spaces. Also, in Fall 2017, Moseley Hall reopened, following a $21 million restoration and renovation. Moseley Hall, built in 1916, originally housed the University’s agricultural science program. Today, it features technologically advanced laboratories for chemistry, biology, geology, and medical lab science. The main academic and residential campus is located on the northeast side of Bowling Green. The campus is arranged in a rectangle roughly one and a half miles long and one mile wide. It includes over 116 buildings on 1,338 acres (5.41 km2). The campus is bordered by Wooster Street to the south, Thurstin Avenue to the west, Poe Road to the north, and I-75 to the east. The university also owns buildings and parking lots throughout Bowling Green and the Bowling Green Research Enterprise Park just east of I-75. Ridge Street and East Merry Street run east–west through campus and Mercer Street bisects campus on a north–south axis. Three large residence halls occupy the western edge of campus. Offenhauer Towers consist of a ten-story and an eleven-story tower, connected by a first-floor lobby. Offenhauer shelters a small grocery store called Outtakes Quick Cuisine. McDonald Hall houses over 1,200 students and an eco-friendly dining facility known as The Oaks. Falcon Heights, a new residence hall, was added in 2011 across the street. The Bowen-Thompson Student Union opened in 2002 in the west-central part of campus. It houses eateries including The Falcon's Nest food court, Starbucks and The Black Swamp Pub. Other facilities include the Campus Bookstore, Outtakes at the Nest (a convenience store), an on-campus post office, computer labs, meeting rooms, a 250-seat movie theater, ballrooms, and various student lounges. Central Campus features large lecture halls and classroom buildings. One of the most prominent is the 95,000 sq ft (9,000 m2) Olscamp Hall, which contains 28 classrooms and lecture halls capable of seating a total of 2,000 students. Others include Business Administration, Education, Math/Science and the Eppler Complex, home to the Sport Management department. Anderson Arena is a 5,000-seat arena, current home for BGSU women's gymnastics and former home of BGSU men's and women's basketball and volleyball. Memorial Hall is connected to Anderson and houses the college's ROTC programs. Jerome Library is the main library on campus and the second tallest building at nine stories. Conklin North is another residence hall in the central portion of campus. Oak Grove Cemetery is located in the north-central portion of campus. Student Health Services was once located next to the cemetery but now is located off campus near the Education building. The BGSU campus police station as well as counseling services are located in the College Park Office Building on the southern edge. Kohl Hall is a dormitory exclusive to members of the Chapman Learning Community, Partners in Context and Community for Urban Educators. A new, predominantly freshman dormitory known as Centennial Hall was established in 2011 and is equipped with its own dining hall, known as Carillon Place Dining. The southern edge hosts on-campus fraternity and sorority houses. Arts programs are located to the east of Anderson Arena and Jerome Library in the east-central area. The Fine Arts Center is home to the School of Art and houses classrooms, a studio, workshop spaces, art galleries a glassblowing studio and faculty offices. BGSU is one of only a few schools that offer degrees in glassblowing. The Moore Musical Arts Center is located along Ridge St and is the home to the College of Musical Arts. Moore includes classrooms, recording studios, rehearsal halls, and Kobacker Hall, a large theater where many performances on campus are held. Moore also includes MidAmerican Center for Contemporary Music, a national center with a focus on the study, performance, creative work and promotion of contemporary music. The Wolfe Center for the Arts opened in December 2011. It is the new centerpiece for the Arts, located between Fine Arts and Moore. The 93,000 sq ft (9,000 m2) building houses the School of Art, the Department of Theatre and Film, and the School of Musical Arts. It includes classrooms, rehearsal space, performance/theater space, as well as design and office space, the 400-seat Thomas and Kathleen Donnell Theatre, and a black-box stage, editing and digital laboratories, classrooms, studios, faculty space, and choral rehearsal rooms. Most athletic and recreation facilities are located on the eastern half of campus. The Student Recreation Center is a 185,000 sq ft (17,000 m2) facility that includes two swimming pools, four weight rooms, a cardio room, an elevated running track, an Activity Center for aerobics and a large sports center which accommodates basketball, tennis, volleyball, and badminton and other sports. North of the center lies Perry Field House, a 127,000 sq ft (12,000 m2) athletic facility with a 100 x 60 indoor synthetic turf, four batting cages, and a 200-meter track encircling four courts for basketball, volleyball, or tennis. 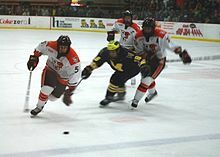 The BGSU Ice Arena is a 5,000-seat ice hockey arena that is used by various teams and clubs as well as public use. The rink is also home to the Black Swamp Ice Frogs, a special needs hockey team. The arena also includes a smaller ice sheet for curling, figure skating, youth ice hockey, and public skating. The Eppler complex is the oldest building on campus for athletics and is the main practice area for cheerleading, gymnastics, dancing and fencing. At one time it housed the original natatorium. Doyt Perry Stadium is a 28,600 seat football stadium located on the eastern edge. The Stroh Center is a new on-campus venue for athletics, concerts, commencement, lectures, and numerous campus and community events. The facility serves as the home for the Falcons men's and women's basketball and volleyball programs. Notably, the new structure is one of the most environmentally friendly buildings on campus, designed to achieve challenging Leadership in Energy and Environmental Design (LEED) certification. There is also the Poe Ditch Rugby field on the north side of campus on Poe Road. BGSU is also home to Forrest Creason Golf Course located on the Northeast portion of campus. It is located to the North of Doyt Perry Stadium. The course is run by Kurt Thomas. The course is open to the public and offers great venues of campus and the surrounding area of Bowling Green. The college is located in Huron, Ohio, about 60 miles (97 km) east of Bowling Green. BGSU Firelands is a non-residential, commuter school and accommodates approximately 2,000 undergraduate and graduate students served by 51 full-time faculty members, as well as part-time faculty. BGSU Firelands has a 20:1 student-faculty ratio. Approximately 32% of Fireland's student population is "nontraditional" (over age 25). The college offers fifteen associate degrees in 22 areas of study and prepares students for transfer to bachelor's programs or for entry into the job market in technical or paraprofessional areas. The college also offers nine on-site bachelor's degree programs in Early Childhood Education, Criminal Justice, Business Administration, Liberal Studies, Visual Communication Technology, Applied Health Science, Nursing, and Advanced Tech Ed. Students can take general education classes towards BGSU majors at the main campus classes or transferring to another four-year institution. First offered in 1946 in the Sandusky area and later expanded to serve Erie, Huron, Lorain, and Ottawa counties, extension programs established a foundation for BGSU Firelands, the university's regional campus. The college was established at a site located near Lake Erie in Huron, Ohio, when the first building (now Foundation Hall) was opened. In 2003, Cedar Point Center opened its doors on the Firelands campus. The facility houses a 450-seat divisible public meeting area, smaller conference rooms, a cyber cafe, multimedia classrooms, and two distance learning classrooms. In March 2011, BGSU Firelands unveiled a new master plan calling for the construction of three buildings to handle more students, more college/community partnerships; and expand the James H. McBride Arboretum to the entire campus. BGSU offered the nation's first PhD program in photochemical science and the first Ph.D. program in applied philosophy. Due in part to a grant from the National Institute of Standards and Technology, BGSU is building a digital forensics lab to complement its digital forensics and cybersecurity courses. The college of Business recently opened a facility at Levis Commons in Perrysburg, Ohio, for its Professional MBA program. BGSU opened a satellite campus offering MBA classes at Owens State Community College in Findlay, Ohio, in January 2013. BGSU is one of only two universities with an airport on its campus. The six-year graduation rate for the university's main campus was 61 percent. Bowling Green State University's six-year graduation rate exceeded its predicted rate of 47 percent. The university's was named in the top five positive differences between actual and expected graduation rates of similar public universities by U.S. News & World Report. Graduation rates for by race among this group are 60 percent unknown race, 60 percent white, 55 percent Asian-American, 50 percent African-American, 50 percent international students, 48 percent Hispanic-American, and 43 percent Native American students. Both its part-time MBA program and graduate program in education are ranked in U.S. News & World Report's 2019 Best Grad School Rankings, at 163 and 124, respectively. The BGSU Center for Sustainability and the Environment was named as one of Ohio's Centers of Excellence in advanced energy by the Ohio Board of Regents in October 2009. The center conducts research on renewable energy such as solar energy and wind generation on Lake Erie, energy conversion, and using algae to generate biofuel. Research in conjunction with the University of Toledo created new ways to effectively determine appropriate Ohio windmill sites. Bowling Green's athletic teams are known as the Falcons. The university participates in NCAA Division I (Division I-A for football) as a member of the Mid-American Conference and the Western Collegiate Hockey Association for ice hockey. BGSU is one of only 13 universities in the country offering NCAA division I-A football, division I men's and women's basketball, and Division I ice hockey. The Falcons' main rivals are the Rockets of the University of Toledo. Separated by just 20 miles (32 km) on Interstate 75, the two schools celebrate a heated rivalry in several sports. The most well-known of these games is the Battle of I-75, a football game held each year in which the winner takes home the Peace Pipe, a Native American peace pipe placed upon a wood tablet. The university sponsors 18 athletic teams: baseball, men's and women's basketball, men's and women's cross county, football, men's and women's golf, women's gymnastics, men's ice hockey, men's and women's soccer, softball, women's swimming, women's tennis, women's track and field, and women's volleyball. The Falcons women's basketball teams had recent postseason success. The team won conference championships in women's basketball in 2005, 2006, and 2007. At the NCAA Women's Division I Basketball Championship, the Falcons lost in the first round in 2005 and 2006, but then reached the "Sweet Sixteen" in 2007. The 1984 Falcons hockey team defeated the University of Minnesota Duluth in the longest college hockey championship game in history, to win the NCAA National Championship. Former BGSU head football coach Doyt Perry led the Falcons to the NCAA "Small College" Football National Title and undefeated season in 1959. Several BGSU coaches went on to prominent careers. Football coach Urban Meyer went on to great success at the University of Florida, earning two BCS National Championship Game appearances in a three-year span, winning in 2007 and 2009. He also won the first FBS Playoff championship while coaching at The Ohio State University in 2015. Hockey coach Jerry York became the winningest active coach in NCAA hockey, winning four NCAA National Championships at Boston College in 2001, 2008, 2010 and 2012 after his Bowling Green championship in 1984. BGSU offers a variety of sports at the club level. Men's sports include cross country/track and field, rugby, lacrosse, baseball, basketball, soccer and ice hockey. Women's club sports include rugby, cross country/track and field, Lacrosse, soccer, softball, equestrian, figure skating, and gymnastics. In recent years, the club rugby team has been very successful. Also, in April 2011, BGSU hosted the National Club Track and Field Championships at Whittaker Track on the east end of campus. Ohio residents account for 85% of the undergraduate student population while out-of-state students come from all 50 US states and 70 foreign countries. The student body consists of 54% women and 46% men, of which, 22% are either of international origin or members of ethnic minority groups. Bowling Green had an on-campus residential student population of 6,500 students as of 2011[update]. Approximately 85% are in-state students. The majority of students attend classes on BGSU's main campus. In addition to the main campus enrollment, 2,500 students enrolled in classes at BGSU Firelands as of 2011[update]. 300 students attend classes at BGSU extension locations, and over 600 students attend classes via distance learning. GeoJourney was a special academic program conducted by the School of Earth, Environment, and Society that featured a nine-week field trip/camping trip/road trip across the United States to national parks and monuments granting 24 students a semester of college credit. The GeoJourney field program included Geology, Environmental Studies and Native American studies. Credits applied to the BG Perspective general education requirements. Students on the journey conducted interdisciplinary field investigations and gained first-hand experiences in a wide range of environments. In 2004 the first GeoJourney trip went to 24 states, 30 national parks and covered over 14,500 miles across the United States. The program was pulled from the University in 2013 by its creators Nichole and Ian Rodgers. The BGSU Main Campus has 14 Residence Halls that house around 6,000 students in total. Some Residence Halls house learning communities such as the Arts Village or La Maison Française. Residence Hall members are represented in student government by each hall's council. BGSU rents some apartments off of campus to house additional students. This is caused by increased enrollment in 2016. BGSU also has a Greek village on campus, which houses 426 Greek members. Bowling Green is home to many fraternities and sororities. The university began Greek community initiatives during the 1940s and it has slowly flourished into a strong community. Each fraternity and sorority at BGSU promotes community service efforts, academic excellence, philanthropic events, and university involvement each through their own nationally recognized organization. As of 2013[update], 8% of undergraduate men and 12% of undergraduate women were members of Greek organizations. BGSU is demolishing its current Greek Town Homes located on old Fraternity Row, old Sorority Row, and the North and South Greek Conklin buildings while they plan and construct a new Greek Village which will consolidate all of the organizations together on the West side of campus against Wooster Street. The plan consists of 10 buildings divided into 33 sections consisting of 4-Bedroom, 12-Bedroom, and 18-Bedroom style homes. The site lies on top of old Fraternity Row and the North and South Conklin building locations. The demolition was scheduled for the fall of 2014 and the new Greek Village finished in the fall of 2016. Electronic media include two radio stations and one public television station, as well as student-produced television. BGSU's Public Broadcasting Service affiliate, WBGU-TV, broadcasts to nineteen counties in northwestern and west central Ohio and hosts PBS programming, local programming and BG24 News, a student-run television newscast airing live at 5:30pm twice a week. The campus is home to two student-operated radio stations as part of the Department of Telecommunications. WBGU 88.1 FM and WFAL Falcon Radio. WBGU-FM serves as an independent radio, non-commercial educational (NCE), FCC-licensed station that focuses mostly on independent music programming and broadcasts women's basketball and hockey; while WFAL Falcon Radio, formerly WFAL 1610 AM, is a student-run commercial radio station that broadcasts music including Modern rock, Top 40, Hip hop and talk shows. Both radio stations host news and sports talk shows and BGSU athletic events through partnerships with other student-media organizations. The Bowling Green Radio News Organization (BGRNO) provides radio news coverage Monday-Friday through student-produced shows; while the Bowling Green Radio Sports Organization (BGRSO) broadcasts BGSU athletic events on WBGU-FM and WFAL as well as local high school sports on WFAL. BGSU's official mascots are Freddie and Frieda Falcon. Freddie Falcon began appearing at athletic events in 1950, while Frieda first appeared on February 25, 1966, as Mrs. Freddie Falcon. Frieda returned in the 1980–81 academic year as Freddie's little sister. 1980 marked the first official female Frieda after the 1966 version was played by a male cheerleader. Freddie and Frieda routinely make appearances at BGSU athletic events and other major events around campus and the community. In a similar tradition to SICSIC, the identities of the students who play Freddie and Frieda are not revealed until the end of the basketball and hockey seasons. Other notable events held by student organizations at BGSU include Ohanami by Japanese Club, and Oktoberfest by the German Club. The Falcon Marching Band is the largest student organization at BGSU, with over 250 members. The band performs at home football games and other university functions including select road football games and various bowl games including the Raisin Bowl in Fresno, California, Silver Bowl in Las Vegas, Nevada, the Motor City Bowl in Detroit, Michigan, the GMAC Bowl in Mobile, Alabama, the Humanitarian Bowl in Boise, Idaho, the Military Bowl in Washington, D.C., and the Little Caesars Pizza Bowl in Detroit. In 2007, the band was invited to the Bands of America Regional in Indianapolis, Indiana. The Athletic Band is auditioned group that at most basketball and hockey games, as well as other university events. The first band to represent what would become Bowling Green State University was formed during the 1923–1924 academic year. Making its first appearance early during the football season, the band's premier performance that year as at the dedication of the new athletic field at Homecoming. The Falcon Marching Band, features a symphonic sound and chair step marching that rivals bands of larger conferences. Under the direction of Dr. Michael King, the 250 member marching band is the largest student organization on campus. The band performs at all home football games, which are hosted in Doyt Perry Stadium as well as other various university functions. The Falcon Marching Band only exists during the football season. Membership is open by audition to students of all class levels and all majors. Alumni of Bowling Green State University have become notable in a variety of different fields including politics and government, business, science, literature, arts and entertainment, and athletics. A number of Bowling Green Falcons have excelled at the collegiate, Olympic, and professional levels sports, including: Kevin Bieksa, Rob Blake, Dan Bylsma, Scott Hamilton, [Dave Wottle], Orel Hershiser, Mike McCullough, George McPhee, Ken Morrow, Don Nehlen, Jordan Sigalet, and Nate Thurmond. Alumni involved in government and politics include: former Israeli ambassador Daniel Ayalon, Ohio state senator Theresa Gavarone, Ohio Department of Higher Education chancellor Randy Gardner, and current Ohio congressmen Bob Latta and Tim Ryan. Other notable alumni include: explorer Conrad Allen; author Philana Marie Boles; TCU Chancellor Victor J. Boschini; actor Tim Conway;, former ESPN sportscaster Jay Crawford; NYU economic professor William Easterly; CBS News Correspondent Steve Hartman; ESPN sportscaster Jason Jackson; NHL Network host Steve Mears; Adobe Systems President and CEO Shantanu Narayen; Owens Corning CEO Brian Chambers, actress Eva Marie Saint; Adena Williams Loston, President of St. Philip's College, author James Carlos Blake, winner of the Los Angeles Times Book Prize; and Grammy Award and Pulitzer Prize-winning composer, Jennifer Higdon. ^ "The Official Identity Colors". Retrieved 2016-08-26. ^ "Bowling Green State University – Overview". U.S. News and World Report. September 2, 2018. Retrieved September 2, 2018. ^ "BGSU at a Glance". Bowling Green State University Office of Admissions. Retrieved 2008-04-06. ^ Jackson, Abby (July 2, 2017). "The most affordable college in every state". Business Insider. ^ "BGSU one of 60 institutions in North America to receive 'Innovation and Economic Prosperity University' designation". Sentinel-Tribune. August 2, 2018. ^ "Grants and Contracts Activity FY2012 First Quarter – Awards (July 1, 2011 – September 30, 2011)" (PDF). Bowling Green State University. Archived from the original (PDF) on October 16, 2013. Retrieved February 26, 2012. ^ "BGSU at a Glance". Bowling Green State University. Retrieved 1 March 2018. ^ a b c d e f g Fall 2018. BGSU – Institutional Research (12 September 2018). "BGSU – Institutional Research – Profile". Retrieved 2 December 2018. ^ a b c Brown, Hal (January 26, 2011). "BGSU enrollment nearly steady from Jan. 2010". Bowling Green Sentinel Tribune. Archived from the original on July 16, 2011. Retrieved March 12, 2011. ^ "miracle network dance marathon: this generation fighting for the next". Miracle Network Dance Marathon. October 1, 2018. ^ "BGSU State Fire School". BGSU. October 1, 2018. ^ a b c d e f g h i j k l m n o p q r s t u v w x y "College of Education and Human Development: Our History". Bowling Green State University. Bowling Green State University. Archived from the original on October 11, 2011. Retrieved September 25, 2011. ^ "Timeline: 1911". Bowling Green State University. Archived from the original on February 12, 2009. Retrieved April 10, 2012. ^ "Timeline: 1914". Bowling Green State University. Archived from the original on March 3, 2012. Retrieved February 27, 2012. ^ "Timeline: 1920". Bowling Green State University. Archived from the original on July 6, 2008. Retrieved February 27, 2012. ^ "March 28, 1920: Western Tornadoes". Ohio Historical Society. Archived from the original on February 6, 2012. Retrieved February 27, 2012. ^ "Timeline: 1926". Bowling Green State University. Archived from the original on July 6, 2008. Retrieved February 27, 2012. ^ "Timeline: 1927". Bowling Green State University. Archived from the original on July 6, 2008. Retrieved February 27, 2012. ^ a b Bowers, Ann; Swaisgood, Linda K. "The History And Traditions of BGSU" (PDF). Bowling Green State University. Archived from the original (PDF) on January 21, 2012. Retrieved April 8, 2011. ^ "Timeline: 1929". Bowling Green State University. Archived from the original on March 3, 2012. Retrieved February 27, 2012. ^ "College of Arts and Sciences". Bowling Green State University. Archived from the original on January 21, 2012. Retrieved April 8, 2011. ^ a b "Timeline: 1935". Bowling Green State University. Archived from the original on October 2, 2010. Retrieved February 27, 2011. ^ "Timeline: 1939". Bowling Green State University. Archived from the original on October 10, 2012. Retrieved February 27, 2012. ^ a b "Timeline: 1943". Bowling Green State University. Archived from the original on June 20, 2012. Retrieved February 27, 2012. ^ "Timeline: 1941". Bowling Green State University. Archived from the original on June 16, 2012. Retrieved February 27, 2012. ^ "Timeline: 1944". Bowling Green State University. Archived from the original on June 20, 2012. Retrieved February 27, 2012. ^ a b "Timeline: 1945". Bowling Green State University. Archived from the original on June 20, 2012. Retrieved February 27, 2012. ^ a b c d e "BGSU Historic Campus Tour: The "Huts"/Barracks/Falcon Heights". Bowling Green State University. Archived from the original on May 1, 2012. Retrieved February 27, 2012. ^ a b "Timeline: 1948". Bowling Green State University. Archived from the original on June 20, 2012. Retrieved February 27, 2012. ^ "Timeline: 1951". Bowling Green State University. Archived from the original on July 19, 2008. Retrieved February 27, 2012. ^ a b "BGSU Historic Campus Tour: Bowen-Thompson Student Union". Bowling Green State University. Archived from the original on October 18, 2012. Retrieved February 25, 2012. ^ "Timeline: 1961". Archived from the original on July 9, 2008. Retrieved February 27, 2012. ^ "Timeline: 1964". Bowling Green State University. Archived from the original on September 21, 2012. Retrieved February 27, 2012. ^ "Timeline: 1967". Bowling Green State University. Archived from the original on September 21, 2012. Retrieved February 27, 2012. ^ a b "Timeline: 1969". Bowling Green State University. Archived from the original on September 21, 2012. Retrieved February 27, 2012. ^ a b c d e "Timeline: 1970". Bowling Green State University. Archived from the original on July 13, 2010. Retrieved February 27, 2012. ^ a b "BGSU Historic Campus Tour: Mathematical Sciences Building". Bowling Green State University. Archived from the original on March 3, 2012. Retrieved February 28, 2012. ^ "Timeline: 1973". Bowling Green State University. Archived from the original on December 22, 2010. Retrieved February 27, 2012. ^ "Timeline: 1974". Bowling Green State University. Archived from the original on December 22, 2010. Retrieved February 27, 2012. ^ "City of Bowling Green Analysis of Impediments to Fair Housing Choice" (PDF). Bowling Green. July 2010. Archived from the original (PDF) on December 13, 2010. Retrieved February 27, 2012. ^ "Timeline: 1972". Bowling Green State University. Archived from the original on December 22, 2010. Retrieved February 27, 2012. ^ a b c Staff (December 4, 2008). "BGSU shows plans for arena". Toledo Blade. Archived from the original on February 4, 2013. Retrieved July 22, 2011. ^ a b Gilbert-Cunningham, Meghan (November 17, 2009). "BGSU plans for 2 new dormitories". Toledo Blade. Archived from the original on February 4, 2013. Retrieved July 22, 2011. ^ Staff (April 6, 2011). "Peak into The Oaks dining hall at BGSU". Fox Toledo. Archived from the original on June 29, 2011. Retrieved July 22, 2011. ^ a b Staff (August 27, 2011). "Oaks dining hall open house is Tuesday". Sentinel Tribune. Archived from the original on February 1, 2013. Retrieved September 12, 2011. ^ "Bowling Green State University and JLL revitalize campus for active learning". JLL. July 6, 2017. ^ Aspacher, Alex (August 15, 2016). "On the brink of demolition, South Hall opens with new name". Sentinel Tribune. ^ "BGSU invites public to tour renovated Moseley, University halls". Bowling Green State University. ^ Dupont, David (August 1, 2017). "Heritage meets the future in two of BGSU's oldest halls". BG Independent News. ^ LaPointe, Roger (August 11, 2017). "BGSU shows off rejuvenated Moseley, University halls". Sentinel Tribune. ^ Dupont, David (May 11, 2015). "BGSU's Moseley Hall to return to science roots". Sentinel Tribune. ^ "BGSU Historic Campus Tour: Psychology Building". Bowling Green State University. Archived from the original on January 21, 2012. Retrieved February 25, 2012. ^ "BGSU Historic Campus Tour: Overman Hall". Bowling Green State University. Archived from the original on October 18, 2012. Retrieved February 25, 2012. ^ a b "BGSU Historic Campus Tour: Offenhauer Towers". Bowling Green State University. Archived from the original on January 21, 2012. Retrieved February 25, 2012. ^ "BGSU Historic Campus Tour: McDonald Quadrangle". Bowling Green State University. Archived from the original on March 3, 2012. Retrieved February 25, 2012. ^ "BGSU Historic Campus Tour: Memorial Hall/Anderson Arena". Bowling Green State University. Archived from the original on October 18, 2012. Retrieved February 25, 2012. ^ "BGSU Historic Campus Tour: Conklin Hall". Bowling Green State University. Archived from the original on October 18, 2012. Retrieved February 28, 2012. ^ "BGSU Historic Campus Tour: Kohl Hall". Bowling Green State University. Archived from the original on September 27, 2012. Retrieved February 28, 2012. ^ "BGSU Historic Campus Tour: Centennial Hall". Bowling Green State University. Archived from the original on October 18, 2012. Retrieved February 28, 2012. ^ "BGSU Historic Campus Tour: Carillon Place Dining". Bowling Green State University. Archived from the original on October 18, 2012. Retrieved February 28, 2012. ^ "BGSU Historic Campus Tour: Fraternity Row". Bowling Green State University. Archived from the original on October 18, 2012. Retrieved February 28, 2012. ^ Dupont, David (December 10, 2012). "New Wolfe Center puts BGSU, BG 'on the map'". Sentinel Tribune. Archived from the original on February 2, 2013. Retrieved February 25, 2012. ^ Staff (May 4, 2007). "Findlay pair give $750,000 to BGSU for theater plans". Toledo Blade. Archived from the original on July 14, 2012. Retrieved July 22, 2011. ^ Staff (October 19, 2009). "Frontpage Bowling Green State University". Toledo Blade. Archived from the original on July 12, 2012. Retrieved July 22, 2011. ^ "BGSU Historic Campus Tour: Harshman Quadrangle". Bowling Green State University. Archived from the original on October 18, 2012. Retrieved February 25, 2012. ^ "BGSU Historic Campus Tour: Kreischer Quadrangle". Bowling Green State University. Archived from the original on October 18, 2012. Retrieved February 25, 2012. ^ "Kreischer Quadrangle". Bowling Green State University. Archived from the original on May 6, 2012. Retrieved February 25, 2012. ^ a b "Arts Village". Bowling Green State University. Archived from the original on February 29, 2012. Retrieved February 25, 2012. ^ "BGSU Historic Campus Tour: Recreation Center". Bowling Green State University. Archived from the original on October 18, 2012. Retrieved February 25, 2012. ^ "BGSU Historic Campus Tour: Perry Field House". Bowling Green State University. Archived from the original on October 29, 2012. Retrieved February 25, 2012. ^ "BGSU Historic Campus Tour: Ice Arena". Bowling Green State University. Archived from the original on October 18, 2012. Retrieved February 25, 2012. ^ Gordon, Kevin (May 5, 2010). "Ice Arena renovations have started". Sentinel Tribune. Archived from the original on September 13, 2012. Retrieved February 25, 2012. ^ "BGSU Historic Campus Tour:Eppler Complex". Bowling Green State University. Archived from the original on October 18, 2012. Retrieved February 25, 2012. ^ "BGSU Historic Campus Tour: Doyt Perry Stadium". Bowling Green State University. Archived from the original on October 18, 2012. Retrieved February 25, 2012. ^ Bowling Green State University. "Department of Recreation and Wellness". Archived from the original on April 24, 2014. ^ "Parking Services:Shuttle Service". Bowling Green State University. Archived from the original on March 2, 2012. Retrieved February 25, 2012. ^ a b "Parking Services: Shuttle Routes". Bowling Green State University. Archived from the original on December 12, 2011. Retrieved February 25, 2012. ^ a b c "Department of Public Safety: About BGSU Police". Bowling Green State University. Archived from the original on March 5, 2012. Retrieved February 25, 2012. ^ Staff (December 2, 2011). "BGSU ratifies contract with its police dept". Sentinel Tribune. Archived from the original on September 10, 2012. Retrieved February 25, 2012. ^ "BGSU Firelands College". Bowling Green State University. Archived from the original on February 5, 2012. Retrieved February 25, 2012. ^ a b c "Statement of Accreditation Status". Ncahlc.org. December 26, 2017. Retrieved December 26, 2017. ^ "Top Public Schools". U.S. News & World Report. Retrieved February 24, 2012. ^ "Best Education Schools". U.S. News & World Report. Archived from the original on March 20, 2012. Retrieved February 24, 2012. ^ "Best Industrial and Organizational Psychology Schools". U.S. News & World Report. Retrieved February 24, 2012. ^ "The most affordable college in every state". ^ a b "2019 Best Graduate Schools". ^ "Graduate Program – Department of Philosophy – BGSU". Archived from the original on October 11, 2012. Retrieved December 9, 2012. ^ "BGSU to offer digital forensics, cybersecurity courses using U.S. standards". Bowling Green State University. ^ "Aviation". Bowling Green State University. ^ Staff (June 22, 2012). "BGSU tuition rising this fall". The Currier. Archived from the original on June 25, 2012. Retrieved August 29, 2012. ^ "BGSU at a Glance". bgsu.edu. ^ "James Baldwin at Bowling Green State University". Bowling Green State University. Archived from the original on January 21, 2012. Retrieved February 26, 2012. ^ Staff (October 28, 2009). "BGSU's first Center of Excellence approved". Sentinel-Tribune. Archived from the original on February 2, 2013. Retrieved February 26, 2012. ^ Staff (February 20, 2010). "Center for Excellence named at BGSU". Sentinel-Tribune. Archived from the original on February 2, 2013. Retrieved February 26, 2012. ^ "Compare Title IX College Sports". FindTheData.com. Archived from the original on July 20, 2012. Retrieved February 25, 2012. ^ Carle, Jack (August 27, 2010). "BGSU president hosts women's documentary preview". Sentinel-Tribune. Archived from the original on February 2, 2013. Retrieved February 25, 2012. ^ Carle, Jack (April 24, 2010). "100 years of BGSU sports history on display". Sentinel-Tribune. Archived from the original on September 9, 2012. Retrieved February 25, 2012. ^ "National Collegiate Club Track & Field Championship – Track & Field Meet". Athletic.net. Retrieved 2013-11-03. ^ King, Lori (January 27, 2011). "BGSU's new dorms draw students to campus". The Toledo Blade. Archived from the original on February 8, 2013. Retrieved March 12, 2011. ^ "FTE Enrollment by Campus". Bowling Green State University. Archived from the original on March 5, 2012. Retrieved February 26, 2012. ^ "Office of Campus Activities: Student Organizations". Bowling Green State University. Archived from the original on February 20, 2012. Retrieved February 26, 2012. ^ a b c d Staff (August 17, 2010). "Bowling Green State University retains recognition". Sentinel-Tribune. Archived from the original on February 2, 2013. Retrieved February 25, 2012. ^ "GeoJourney". GeoJourney. Bowling Green State University. Archived from the original on February 17, 2012. Retrieved February 25, 2012. ^ "Outdoor Program – Freshman Wilderness Experience". Bowling Green State University. Archived from the original on November 5, 2011. Retrieved February 25, 2012. ^ "AORE Awards History" (PDF). AORE. Archived from the original (PDF) on March 8, 2012. Retrieved February 26, 2012. ^ "Residence Life". Bowling Green State University. Retrieved 2017-01-06. ^ "Learning & Theme Communities". Bowling Green State University. Retrieved 2017-01-06. ^ "Hall Council". Bowling Green State University. Archived from the original on July 4, 2017. Retrieved January 6, 2017. ^ "Apartments". Bowling Green State University. Archived from the original on July 3, 2017. Retrieved January 6, 2017. ^ "BGSU addresses on-campus housing crunch". Sentinel-Tribune. Retrieved 2017-01-06. ^ "Greek Village". Bowling Green State University. Retrieved 2017-01-06. ^ "BGSU Pan-Hellenic Council". Bowling Green State University. Archived from the original on April 9, 2013. Retrieved September 18, 2014. ^ "Fraternity and Sorority Life: National Pan-Hellenic Council". Bowling Green State University. Archived from the original on April 9, 2013. Retrieved February 26, 2012. ^ "Fraternity and Sorority Life: Multicultural Greek Council". Bowling Green State University. Archived from the original on April 1, 2012. Retrieved February 26, 2012. ^ a b "Center for Archival Collections: NW Ohio Newspapers, Cities A-C". Bowling Green State University. Archived from the original on February 21, 2012. Retrieved February 26, 2012. ^ a b "BG News Rate and Publication Schedule 2010–11" (PDF). BG News. Archived from the original (PDF) on August 14, 2011. Retrieved February 26, 2012. ^ "About". WBGU-FM. Archived from the original on June 30, 2011. Retrieved February 25, 2012. ^ a b "Department of Telecommunications Student Organizations". Bowling Green State University. Archived from the original on February 18, 2012. Retrieved February 26, 2012. ^ "History of the Mid-American Review". Mid-American Review. Archived from the original on March 2, 2012. Retrieved February 26, 2012. ^ "About The Projector". Bowling Green State University. Archived from the original on October 3, 2011. Retrieved September 12, 2011. ^ "SICSIC". Bowling Green State University. Archived from the original on March 3, 2016. Retrieved March 4, 2008. ^ "History of Freddie and Frieda Falcon". Bowling Green State University. Archived from the original on April 4, 2008. Retrieved April 6, 2008. ^ a b c Staff (April 8, 2010). "BGSU students dance though weekend marathon". Sentinel-Tribune. Archived from the original on February 2, 2013. Retrieved February 26, 2012. ^ Bade, Nick (February 17, 2012). "Winterfest runs through Sunday". WTOL. Archived from the original on July 7, 2012. Retrieved February 26, 2012. ^ Strawbridge, Lisa (February 17, 2010). "Winterfest begins Feb. 19 in Bowling Green". WTOL. Archived from the original on February 19, 2010. Retrieved February 26, 2012. ^ Bade, Nick (June 10, 2011). "BGSU to host Buckeye Boys State June 11 – 19". WTOL. Archived from the original on July 1, 2012. Retrieved February 26, 2012. ^ a b c d "University Bands". Bowling Green State University. Retrieved December 13, 2015. ^ "Dan Bylsma – Stats". NHL. 1970-09-19. Retrieved 2013-11-03. ^ "Mike McCullough PGA Profile". PGA. Archived from the original on January 21, 2012. Retrieved February 26, 2012. ^ "1982 – George McPhee". Hobey Baker Foundation. Archived from the original on March 25, 2012. Retrieved February 26, 2012. ^ Staff (October 3, 2011). "Former BGSU coach Don Nehlen". Sentinel-Tribune. Archived from the original on September 12, 2012. Retrieved February 26, 2012. ^ "Tim Ryan (D)". The Washington Post. Archived from the original on February 6, 2012. Retrieved February 26, 2012. ^ "Author Philana Marie Boles". HarperCollins. Archived from the original on May 27, 2011. Retrieved February 26, 2012. ^ Staff (April 21, 2010). "BGSU honors top grads". Sentinel-Tribune. Archived from the original on February 2, 2013. Retrieved February 26, 2012. ^ Carle, Jack (November 26, 2010). "Perrysburg grad is voice of BGSU women's team". Sentinel-Tribune. Archived from the original on September 13, 2012. Retrieved February 24, 2012. ^ "Steve Mears Bio". National Hockey League. Retrieved May 5, 2017. ^ 1954-, Raines, Robert,. Composition in the digital world : conversations with 21st century American composers. New York, NY. ISBN 9780199357031. OCLC 880689841. ^ Reitz, Christina L. (2012-02-06). Higdon, Jennifer. Oxford Music Online. Oxford University Press. Wikimedia Commons has media related to Bowling Green State University.